HOUSTON, TX, November 16, 2018 – Sentai Filmworks announced today that it acquired exclusive distribution rights to Is It Wrong to Try to Pick Up Girls in a Dungeon? : Arrow of the Orion, the feature-length film, based on the hugely popular franchise known to insiders as DanMachi. The original television series, first released outside of Japan by Sentai Filmworks in 2015 was a breakout hit and enduring fan favorite. Produced by EGG FIRM + SB Creative and directed by Katsushi Sakurabi (Flying Witch and The Pet Girl of Sakurasou) the feature also enlists Yasuhiro Oumura (Azumanga Daioh and When They Cry) as art director. Shigeki Kimoto (Flying Witch and Azumanga Daioh) expands upon the character designs from the series’ original character designer, Suzuhito Yasuda. 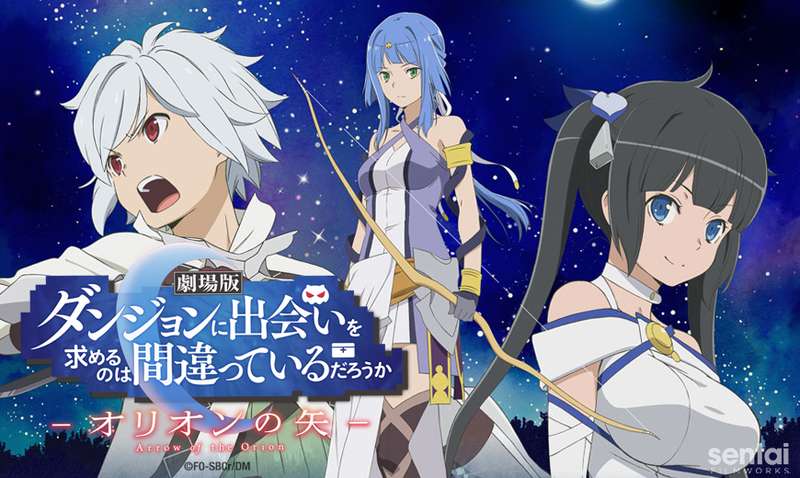 arrow of the orion is it wrong to try to pick up girls in a dungeon? : arrow of the orion danmachi is it wrong to try to pick up girls in a dungeon?